The Research Lab team is pleased to announce that our recently published article in the Respiratory Journal was recently chosen as Editor’s choice for the March 2018 Issue (Issue 23.3)! You can read our abstract below and access the full article on the RESPIROLOGY website. The news was also shared on Respoirology’s Twitter account! 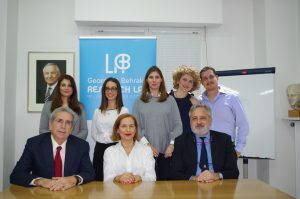 The Greek study team at the George D. Behrakis RESEARCH LAB in Athens. From left to right – seated: Panagiotis K Behrakis, Anna Tzortzi and Nikolaos G Koulouris ; standing: Chara K Tzavara, Stephanie I Teloniatis, Sofia A Gennimata, Efstathia Konstantinidi and Andreas Lappas. Background and objective: This study investigated the duration of immediate respiratory effects of e-cigarette smoking (ECS) and tested the hypothesis that ECS has more prominent effects in asthmatics compared with healthy smokers (HS). Methods: Fifty-four smokers, 27 healthy (HS group) and 27 with intermittent asthma (mild asthma (MA) group) underwent a control session (no liquid, no resistor coil inside e-cigarette cartridge) and an experimental session of ECS using standardized puffing settings. Impulse oscillometry impedance (Z), resistance (R), reactance (X) and fractional exhaled nitric oxide (FeNO) were measured before and 0, 15 and 30 min after control and experimental sessions. Results: Control session revealed no significant changes. In the experimental session, immediately post-ECS, both groups exhibited a significant increase in respiratory system total impedance at 5 Hz (Z5) (P< 0.001), respiratory system resistance at 5 Hz (R5) (P< 0.001), respiratory system resistance at 10 Hz (R10) (P< 0.001), respiratory system resistance at 20 Hz (R20) (P < 0.05), resonant frequency (P < 0.001) and reactance area (P < 0.05). MA exhibited higher baseline values and a more prominent effect immediately after ECS compared with HS for Z5 (P = 0.022), R5 (P = 0.010) and R10 (P = 0.013). FeNO decreased significantly in both groups (P < 0.001); HS returned to baseline values in ≤15 min while the MA maintained significantly lower values for an additional 15 min (P < 0.05) and returned to baseline values at 30 min post-ECS. Conclusion: A single session of ECS had respiratory mechanical and inflammatory effects, which were more prominent in smokers with asthma.